The difference between playing slots and betting on horses may sound obvious — but it's not at Greyhound Park in Post Falls. 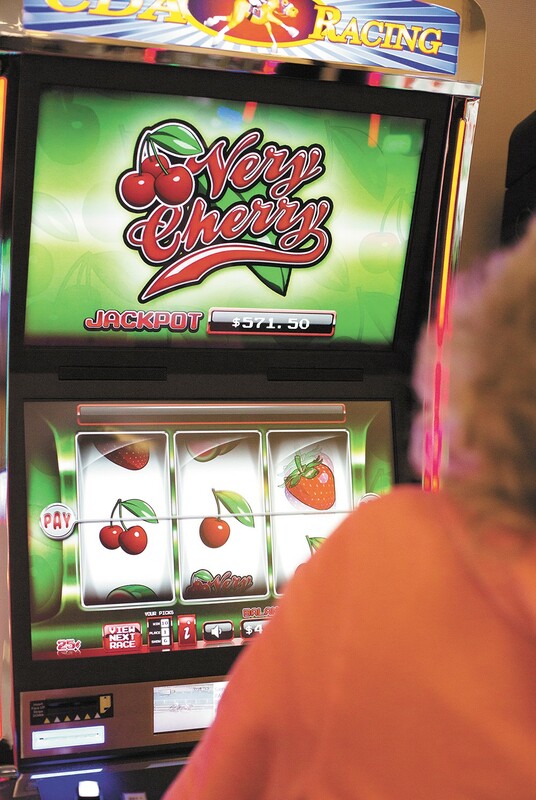 Near tracts of vacant Post Falls outlet malls, three cherries — synonymous with slot machines ever since slots gave out fruit-flavored chewing gum a century ago — line up in a row on the Greyhound Park and Event Center video billboard. "New games are here!" it proclaims. "Winners play here!" It's been nearly 20 years since the last greyhound raced at Greyhound Park. These days, the predominant sound at the facility isn't the barking of dogs or the cheering of fans. It's the chattering of gaming machines. "It's time to make your dreams come true and live a life of pleasure!" the Deep Sea Treasure machine sings to a reggae beat. "Don't stay behind; it's time to find your deep sea treasure!" Hit a few buttons, and the columns of treasure chests, pufferfish and minnows start spinning. There are 35 gaming machines at Greyhound Park, with names like "Cruisin' For Cash," "Yukon Willie's Gold Rush!" and "Wild West Willie's Bonus Spin!" They look like slot machines, spin like slot machines, beep and whir and shell out big winnings like slot machines. But in Idaho, outside of Indian casinos, slots are illegal. Wagering on horse and dog races isn't. Thus, the result of each wager on these "instant-racing machines" is tied to a past horse race. Once the hearts, sevens, guitars, mining picks, gold nuggets, Egyptian scarabs or fuzzy dice stop spinning, a tiny video, barely as tall as business card, plays a few blurry seconds of horses passing a finish line. From Oaklawn Park in Arkansas to Kentucky Downs, these "instant racing machines" are supposed to be the salvation of the dying horse racing and dog racing industries. But in state after state, they've become the subject of lawsuit and controversy. In just the past month, Idaho's Indian tribes have objected, the Post Falls Police Department has launched an investigation, and Idaho legislators passed a bill out of committee to once again make the machines illegal. As Greyhound Park patron Bob Burnell talks, every so often he hits the button on the "Get Your Kicks On" instant-racing machine. He barely glances at the results. "This is all luck," Burnell says. "Probably should switch machines. This machine's just toying with me." He'd rather be betting on dog races. He's been coming here since 1992, back when greyhounds ran around the track out back. He'd scrutinize their stats and watch whether they cowered around other dogs. Two decades later, he still remembers one of the dog's names — Gladys Bullseye — in the Greyhound Park race where he won $25,000. "I paid my house off," he says. After the cherries spin, a horse race snippet plays on the screen below. The final days of Greyhound Park's dog races were ugly ones. "It was called the 'End of the Line' track," recalls Gin McKean, founder of Greyhound Rescue of Idaho. "There was a lot of really bad abuse." Trainers witnessed dogs being drugged, beaten, executed, placed in diesel-soaked cramped crates and electrocuted on a "Tijuana hot plate" for being too slow. In one single weekend, a 1995 Spokesman-Review story described, seven dogs fell, breaking their legs on the track. Thanks in part to efforts from McKean, Idaho banned dog racing in 1996. Today dog racing is nearly dead, with only a handful of tracks left nationwide. Horse racing is alive, but limping. Blame the rise of casino-style gambling or the loss of public appetite for a sport marred by corruption, drugging and dead, beaten horses. In Idaho, the introduction of the state lottery in 1988 accelerated the decline. But remarkably, Greyhound Park has survived. Today, bingo games are held there. The facility, with its huge footprint, has been repurposed as an event center, used for flea markets, gun shows and an upcoming Valentine's Day ball. But racing remains the primary focus. On a Saturday morning, most of the Greyhound Park patrons are watching "simulcasts" — live television broadcasts — of traditional horse and dog racing on a vast array of ancient TVs and modern computer monitors. Simulcasting still carries controversy. "Greyhound simulcasting is just a prop to keep dog racing alive," McKean says. "That means some dogs, somewhere, are running and dying." Complicating matters further, in the past few years, conglomerates controlling the big-name horse-racing tracks have dramatically increased their simulcast fees. A few years ago, Greyhound Park stopped paying the steep fees to broadcast races from some of those tracks. "This place used to have 80 to 100 people" in the evenings, longtime horse racing fan Ed Howe says. "As soon as they lost what they could carry — now they're all out at the casinos." That's left instant-racing machines as one of the few remaining solid sources of revenue: Far from being worried about their impact, Idaho's racing regulatory body is one of their biggest champions. "I can tell you since the inception of this in Arkansas, it has turned things around for Oaklawn Park," Frank Lamb, executive director of the Idaho State Racing Commission, testified in 2013. "It is amazing, the transformation. I believe it can do the same thing here." Today, the Arkansas Times reports, casino gambling at Oaklawn has exploded, with traditional horse and dog racing now making up only a tiny sliver of its revenue. With some of the revenue used to support live horse racing, Lamb says the machines are keeping the sport alive in southern Idaho. "Small tracks [are getting] $6,000 a day," he says. Last year, instant-racing machines made more than twice as much revenue for tracks as simulcasting. In 2013, Lamb argued that the only important difference between the machines and classic horse-race wagering is that you'd be "wagering on a previously run horse race." "You get to know what the best trainer in the race is... what the jockey's winning percentage is," he said. And after your bet, Lamb explained, "you can watch the whole race or just the last 100 yards." Even the tribes didn't object. But that was until they saw the machines that were installed. "The fact of the matter is, this was a classic bait-and-switch," says Helo Hancock, the Coeur d'Alene Tribe's legislative director. "We all got duped." All that information on horses and jockeys? On most of the machines at Greyhound Park, it's nested deep within layers of screens and buttons: Finding the stats requires pressing the "Help" button, the "Handicap" button, the "Page Down" button, the "Handicap Next Race" button and then — only after confirming a bet — a button that offers up a few pie charts with the horse's statistics on them. The charts last for five seconds, barely enough time to read the numbers, before permanently disappearing and being replaced by the words "Good Luck!" Rep. Vito Barbieri doesn't want to make the machines illegal, but he objects to how tough it is to view the horse-racing data. "I get it. Everyone wants more revenue. The faster you press that button, the faster [they get that revenue]," Barbieri says. "I just think that handicap information should be more available." 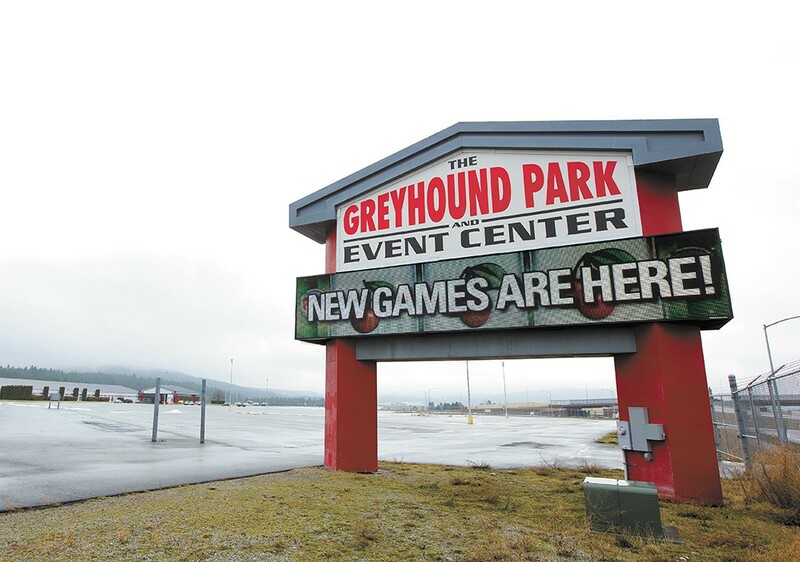 It's not Greyhound Park's fault, explains Julie Hart, executive director of Idaho Wins, a nonprofit organization dedicated to promoting horse racing in the state. The machines have changed since 2013. "In Idaho, when the legislation was passed, it was only the second generation [of machines] that was available for anyone to look at," explains Hart. The machines with horse racing information obscured — the only ones currently available — are of the third generation. Despite multiple attempts to reach him, Douglas Okuniewicz, manager at Greyhound Park, did not return phone calls. But in an earlier Coeur d'Alene Press story, he redirected the focus toward tribal gaming: "If anyone is being duped, it is all of us that are being subjected to the fiction of calling a slot machine a tribal video gaming device," he said. Okuniewicz knows such machines well; he's been filing patents concerning slot-machine technology since 1997. Much of the legal debate is definitional. For example, do the machines count as horse-race-style "parimutuel betting," which pits bettors against each other instead of against the house? On one hand, unlike a typical slot machine, 89 percent of the money wagered goes into a multistate pool that rewards winning bettors. Yet unlike actual horse racing, bettors aren't betting on the same race, and the odds don't change as bets stream in. The argument may not ultimately matter. Last Friday, after testimony from a Coeur d'Alene Tribe lobbyist, the Idaho Senate State Affairs committee introduced a bill that would repeal the 2013 statute making the machines legal. "Let's repeal what we did, and start afresh," Rep. Luke Malek of Coeur d'Alene suggests. "I'm leaning towards saying let's have a full conversation about gambling." Lotteries, slots, horses, dogs, poker — everything. Hart, however, worries that if the instant-racing machines disappear, horse racing will as well.